I would watch anything with Michael C. Hall ("Dexter"), but this is definitely worth watching. In this 8 part series, Hall plays a British doctor, Tom, who lives in a gated community. A year after his wife dies, his daughter disappears after going to a party. He spend most of the series trying to find her, and he uncovers the secrets of his neighbors as he does. It's very compelling and has really good characters. I've only watched the first two episodes so far. It's definitely roped me in...now I need to watch the rest to find out what's going on. The only thing I would change is that it appears that everyone has some sort of horrible secret, and they dramatically zoom in on the characters' faces as they consider something or look panicked. We've seen this happen so many times in other mystery shows that it's a cliché now. Hall does a great job with the accent as far as I can tell. Don't miss it! RED Production Company called “action” as filming commenced in Manchester on original new television drama, SAFE. The 8 x 60’ series has been ordered by CANAL+ Group and Netflix and will run on free-to-air channel C8 (CANAL+ Group) in France and Netflix globally outside of France in 2018. 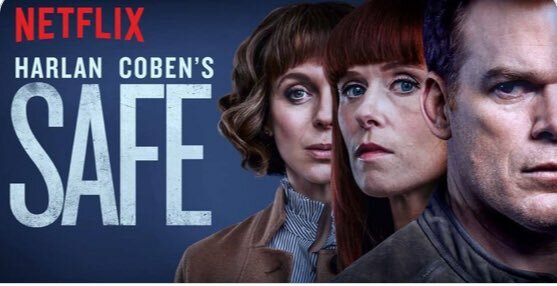 The eight-part series is created by bestselling writer Harlan Coben and written by BAFTA and Emmy Award winning writer Danny Brocklehurst (Ordinary Lies, The Driver, Shameless). Multi-award-winning Michael C Hall (Dexter, Six Feet Under) is playing Tom, a paediatric surgeon and single father of two teenage daughters who is struggling to deal with the loss of his wife from cancer more than two years previously. Living and raising his children in a beautiful gated community surrounded by close friends, Tom finds himself on a journey that transforms everyone he knows. How far will you go to protect your family? It’s a question often asked, but Tom will now live it. Amanda Abbington (Sherlock, Crooked House) joins Hall and is playing Sophie - a formidable detective sergeant. Intelligent, dynamic, perceptive and smart, Sophie lives in the same gated community as Tom and like him, is raising two kids single-handedly. Sophie knows you can’t trust anybody and we glimpse that she is burdened with secrets of her own. Sophie is separated from her husband Josh who is played by Emmett J Scanlan (The Fall, Hollyoaks). Josh is desperately clinging onto his youth - going to gigs, partying all night and generally letting his family down at every opportunity. He does all this in plain sight, choosing as he does, to live in a battered old caravan on his estranged wife Sophie’s, driveway. Harlan Coben storyline and getting to work with Michael C Hall makes me very happy to be working with RED Production Company on Safe”. Adding to the stellar line-up are Nigel Lindsay (Victoria, Four Lions) and Laila Rouass (Holby, Stella, Footballers Wives) who play happily married couple, JoJo and Lauren Marshall. They have a rock-solid marriage, a beautiful daughter and a fairy-tale lifestyle. However, as their family become embroiled in a crime, their perfect little world explodes in ways they could never imagine. Nigel commented: “It’s a good sign when you read the first three episodes of a script and you’re desperate to know what happens next. I read Safe and was hooked. I’m a big fan of Harlan Coben and Michael C Hall and am really looking forward to getting stuck in”. Laila added “I've been a fan of Harlan's work for a long time and I am hugely excited to be a part of this project and to be filming in Manchester." Safe is executive produced by Michael C Hall, Nicola Shindler, Harlan Coben, Danny Brocklehurst and RED's Head of Development, Richard Fee. The series is produced by RED Production Company (a STUDIOCANAL company), the multi-award-winning producers behind Happy Valley and Last Tango in Halifax.